Print Capture Hardware for printer replacement provides dot matrix printer alternative. Paperless Printing from machines, measuring instruments, analyzers or DOS based legacy equipment. 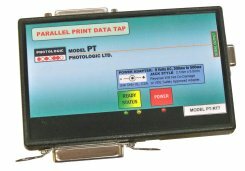 Photologic Ltd. has extensive experience working with parallel and serial printer interfaces on legacy computer systems, since 1991. If you need a hardware device to help you replace your old dot matrix printer and capture the print data to a PC, then please consider our solutions.  Need  a dot matrix printer alternative ?  Need  to rescue print data off a legacy system?  Require  backup records for FDA 21 CFR Part 11 ? Parallel print cables from machinery, instrumentation, DOS based PCs and measuring equipment can be automatically typed in a Word document screen. (Text print data). Some Word versions can be set to automatically periodically save to file. Print 24/7 for alarm systems applications. Documents can be hundreds of pages long. Apply Windows fonts and colors! PHOTOLOGIC LTD. www.photologic.ca TEL: (905) 377-8915 email Photologic Ltd.
 Retire printer or keep printing.  Record while printing to satisfy quality compliance record-keeping mandates.  Retrieve data at any time, - no need to deploy a PC full time to capture in real time. Model PDXS25  For LPT Parallel print cables. Send a command string to return data stream.  Eliminate Dot Matrix Printers. 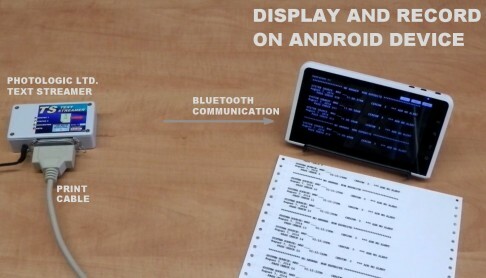  Android device acts as both a display and recorder of print data.  Versions available for Parallel or RS232 Serial print cables. Use PDF Automator to replace legacy printers. The pdf is made as soon as the report has ended. a unique filename to a folder of your choosing. print data in the background. 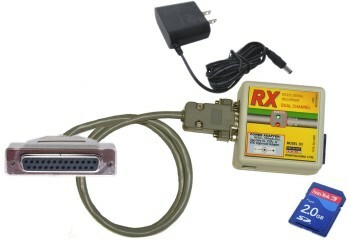 that uses a parallel LPT port or RS232 serial port. Our print capture solutions can help you modernize older equipment by giving you an electronic record rather than a hardcopy printout. For printer replacement: our print capture solutions deal with such printers as Epson, Okidata, Printronix, Hewlet-Packard, C.Itoh. Tally, Mannesmann, Genicom, Dataproducts, Fujitsu, Zebra, Centronics, Seiko, and various thermal printers and lineprinters. Our hardware devices also help you eliminate DOS printers that are connected with Centronics parallel or IEEE-1284 print cable, or RS-232 serial print cable. sensors, alarm systems, and print cables. - Logs ASCII and Binary (all possible 8 bit codes). 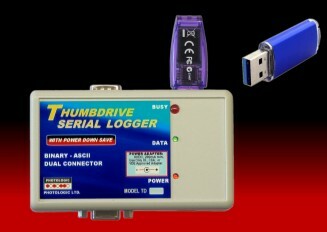 the Thumbdrive log file so that the file structure is complete and the file does not become inaccessible. If required, use DB25 Adapters to match cabling connectors. A NUL Adapter to reverse data direction should not be required as this unit has a NUL switch that saves the user from adding a NUL Adapter or soldering to reverse pins. Just Enable or Disable the NUL function with the internal switch. DOS Based PC's, Machines,  Analyzers, Alarm Systems.   Record weeks and months of plain text data.   For unattended 24 hr. operation..
  LED indicators help confirm operation.  Keep printer or eliminate printer.  No front panel controls.  No settings or license.  Is meant to automatically recover after power outage. Our hardware devices help you extract data from equipment without you having to use a printer. There is no software that you have to load or modify on your equipment. 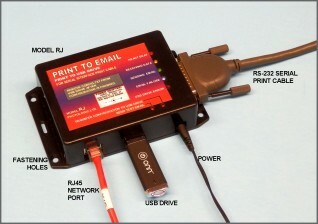 Just direct the print data to a parallel or RS232 serial port where our capture hardware device can do it's work. Once you have the data captured, you have options to do what you need with the data such as parse it for spreadsheet, archive it, share it on the network,email it, convert it to PDF or even print it to another printer on your PC system. No licensing or monthly fees are involved with our solutions. You can produce electronic records for record keeping compliances/mandates from various kinds of printers that print plain generic text with tractor feed such as impact dot-matrix printers, (e.g. DOS printer), or PCL type printers that are used to print graphics and colors such as laser printers and ink jet printers using PCL print emulation, ( e.g. PCL4 or PCL5). - User chooses any data capture software. your PC lacks a DB9 Comm Port. Record while printing or record without a printer. 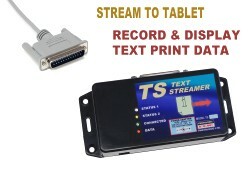 - Dual Channel:   Tap into working systems to record half duplex dialogs. - Parallel in, parallel out to printer. - Printer can also be eliminated with nul printer module. - Serial stream out to capture. Print data byte is transfered to printer, then to Capture PC one byte at a time so equipment is always in step. The printer speed paces data to Capture PC. Standard hardware flow control on Capture PC paces data to the printer. automatically sent to multiple email recipients from a distribution list. For plain generic ASCII text on print cables.